Generally there are 2 types of worlds in Zezenia: Non-PVP and PVP. On PVP worlds players can attack each other everywhere except in protection areas, such as depots. PVP worlds have automatic countermeasures against massive player killing. On Non-PVP attacking other players is only possible in certain conditions, such as when in a battle arena or in a guild war. More about player versus player combat can be read in the manual articles combat and death. Pharos PVP 2x experience world Challenge Task training rewards are 2x standard rate until skill 100. 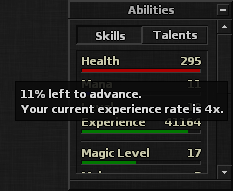 Please Note: You can always view your current experience stage by hovering the experience value in the Abilities sidewindow.